Keeping the plan of Mies van der Rohe’s Barcelona Pavilion in mind, New York-based architects Stamberg Aferiat created an eye-catching, colorful home. Built using industrially produced materials and current sustainable principles, the home features seemingly disjointed planes that create the overall geometry of the structure. 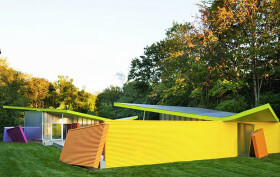 Located in the island with the same name, the Shelter Island Pavilion is an experiment in color, shape, and sustainability.